We are able to suggest, arrange and organize strength and flight tests, which are essential for certification of small aircraft. Also we can offer partial tests necessary for solving of individual problems at development of parts or tests for verification of strength analysis methodology. Again we co-operate with reputable test laboratories, e.g. 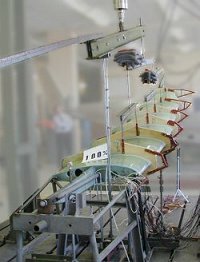 Test Room of the Institute of Aerospace Engineering, Faculty of Mechanical Engineering at Brno University of Technology, at actual tests conducting.